As you already know, Japan is a country full of “Kawaii” items, such as Hello Kitty, local mascot characters (Funassyi, for example), and so on. Also, some of you might imagine Manekineko which is popular among people over the centuries as a good-luck item. Today I would like to spotlight the other kawaii icon, tanuki (raccoon dog). It is one of the Japan’s cutest characters with its funny face and round body, making people smile. Speaking of tanuki, tanuki statue of the Shigaraki ware is famous. It is loved as lucky goods for business and normally placed in the entrance of shops and restaurants. If we play on words in Japanese, the word “tanuki” can be divided into “ta” and “nuki”. “Ta” is others, and “nuki” is a noun form of a verb “nuku” that means to outstrip. And then, tanuki stands for outstripping a rival. That’s why tanuki pottery is a symbol of success and wealth. The Shigaraki ware began in Shigaraki-cho, Shiga prefecture in Kamakura period (1185-1333), which is one of the oldest and biggest potteries in Japan. It was not long time ago that tanuki pottery became famous as a lucky item. When Hirohito, the emperor Shōwa visited the town in 1951, people welcomed him locating many statues along the streets. As he loved the Shigaraki tanuki, he was impressed and left poetry. Tanuki appears in some Japanese old tales, generally it cheats human to steal harvests or help villagers who saved its life become rich. Tanuki is drawn as an animal with lovely round funny face and figures. Here I am going to show you one of the folktales, Bunbuku Chagama. Once upon a time, a poor man found a tanuki caught in a trap. He felt sorry and set it free. Later in the night, it came to the man’s house as a token of thanks and told him “I would be transform into a teakettle, so why don’t you sell me for money?” The next day, he went to a temple to sell it to a priest. The priest filled water in the teakettle and set fire on it. As tanuki could not stand the heat, his face, legs and tail got out of the kettle. And then he ran away to the man’s house and said “Why don’t you open a show house and I will perform ropewalking with my funny half kettle-animal body. This idea hit the jackpot. He became rich and tanuki as well happy. The story is based on a legend of Morinji-temple (Gunma), in which tanuki is said to have transformed into a priest to bring to the temple the teakettle that kept water springing out like a fountain. Let’s go to see tanuki! 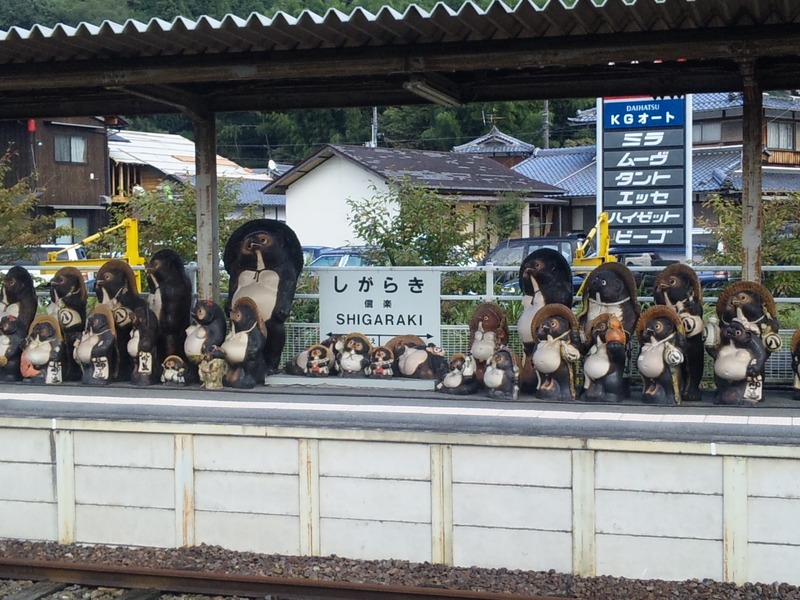 The station is decorated with tanuki potteries. This is the paradise for earthenware lovers. You can definitely find not only your favorite tanuki pottery also fantastic tableware. A ceramic art class is open. This temple is famous for the tale Bunbuku Chagama and the legendary teakettle that is preserved there. In the site you can see many tanuki collections. In spring cherry blossom are very beautiful. – You can see many kinds of statues in the temple. Hina-matsuri is a festival to celebrate girls’ wellness and happiness decorating a set of dolls that wear ancient costumes in a staircase-like platform. In this temple, the tanuki statues are dressed kimono and you can see that lovely tanuki potteries are beautifully decorated like hina dolls. Previous PostMust-Visit Place! Blue Lagoon Islands YaeyamaNext PostHow to Enjoy Mt. Fuji Climbing, Art, and Religious Mystique.